In music, pitch is the highness or lowness of a note. In order to learn music, we’ll need some way to write down and talk about those pitches. For guitar players, musical pitches can be notated in one of two ways. One is called standard notation, and this shows the specific pitches and rhythms of the music, leaving it up to the player to figure out where the notes are. The other way is to notate the pitches in tablature, which is basically a drawing of the guitar strings. A number is written that shows which fret to push on each string. While this is convenient for fingerings and guitar licks, the musical notation system is better for general purposes because it shows musical relationships clearly. This example melody is written in standard notation on the top and guitar tablature on the bottom. The tab on the bottom shows where to put our fingers to produce the notes, but doesn’t show us much about the music itself, such as what notes are played and how the melody behaves. Elementary music classes often begin by teaching the names of the notes. Without any use for these notes, though, it’s a little pointless to learn them. It is important to play the notes you learn, and study written music for the purpose of playing and understanding real music. Everything you learn should have real applications. In music, mere knowledge is useless on paper. For guitar players, the 5-line musical staff begins with a funny symbol called a treble clef. This is also sometimes called a “G clef”, because the function of the clef is to wrap ornately around the note G. In designating this note as G, the meaning of all other lines and spaces on the staff are now defined. Move up one note and you have A. Move down one note and you have F. And the 7 notes of the musical alphabet repeat forever. The four spaces between the lines can be learned easily because they spell the word “FACE”. Use this mnemonicA learning device used to aid memory through association. to remember the names of those notes whenever you’re looking at one of these four. The five notes on the lines go in this order: E, G, B, D, F. You can use the mnemonicA learning device used to aid memory through association. “Every Good Boy Does Fine” to remember this. There are other ones, too, but this one is the most well-known. You may want to make up your own to aid memory. Perhaps this system of notation is easier to understand if we look at an ascending C major scale (C to C) and draw it on this grid, called a staff. The notes are C, D, E, F, G, A, B, and C. This staff has only five lines, but its rangeRange is the total melodic distance an instrument is capable of, from lowest possible note to highest possible note. It can also mean the total distance between the highest and lowest notes in a melody or musical part. can be extended infinitely by drawing ledger lines above or below it. The first note, C, is written on a ledger lineLines used to extend the range of standard music notation above or below the five-line staff normally used..
Can you see any notes that were in our “FACE” example? What about the “EGBDF” example? This grid is good for describing music because each letter name is represented once. There are 7 named notes in music: C, D, E, F, G, A and B. But there are 12 total notes, and some of them are written with something called an accidentalAny named note whose pitch is modified by a sharp (♯) or flat (♭) symbol. This even includes notes that are returned to a non-sharp or non-flat by the natural symbol (♮)..
For instance a B♭Pronounced “B flat” is the note between and A and a B. That means a B♭ and a B will both occupy the same point in the graph; we can tell the difference because the note can be altered to a B♭ by the appearance of a flat signA flat sign looks like this: ♭ left of it. So the first note is a B and the second note is a B♭. This is convenient because most songs use seven primary notes, with the others happening less frequently. This means there are five “hidden” notes in this scale that don’t have their own position. By folding them out of the picture, we can focus on the primary notes that we’ll use. When accidentalAny named note whose pitch is modified by a sharp (♯) or flat (♭) symbol. This even includes notes that are returned to a non-sharp or non-flat by the natural symbol (♮).s do appear, they’ll appear in the same position as the naturalA natural sign looks like this: ♮ notes. An accidental is canceled whenever we cross the bar-lineA vertical line separating two measures of music. into a new measureA group of musical notes separated by vertical lines, normally of equal length (e.g., four beats per measure.) . In this way we can use a system of notation that’s designed for music consisting of 7 primary notes, but the other five are still available when needed. What if We Need Alot of Accidentals? The note on the first measure’s top line is F♯; in the next measure it is F.
Some accidentals are written into the key signatureA marking used at the beginning of a piece of written music to indicate the key; normally, which notes will be sharp or which notes will be flat. (But not both), such as the F♯Pronounced “F sharp” in the example below. 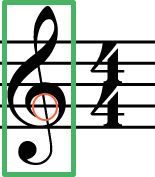 Note that there is a sharp sign (♯) immediately at the beginning of the music, positioned on the line where the note F would normally appear. This means that all “F” will always be “F♯” in this piece of music, unless it’s canceled by a natural sign—and this includes any F that might be written on some other line, as well. There are no notes between tones E and F or between tones B and C. We can see that if we write a sharp sign in front of the B, which means, “move this note up a half stepThe smallest possible step, consisting of a minor second. For instance, fret I and fret II are separated by a half step.,” the only logical thing to do is to play C. Similarly, a “C♭ ” must really be a B. Both pitches in the first measure are “C”; both in the second measure are “B”. In the examples above, all pitches appeared in a series. This is how melodies appear. Understanding how these pitches work helps us if we want to interpret a melody or write one of our own. In memory, melodies may be forgotten or performed differently. Musical notation is fixed. Once it is written, it can be preserved forever. Pitches can also appear in a stack, where they are played all at once. This creates a harmonyThe combination of pitches, usually three or more, which results in a chord. or chordA harmonic structure (that is, the combination of several notes) which ideally produces a pleasing sound. Chords are normally created by stacking notes in groups of thirds..
Memorize the names of the notes on the treble clef, from one ledger line below to one ledger line above. The notes on the spaces spell “FACE”. Memorize these notes. A mnemonic is often used for the notes on the lines: “every good boy does fine”. Memorize these. Review all of the notes above and make sure you can read them by identifying their name.